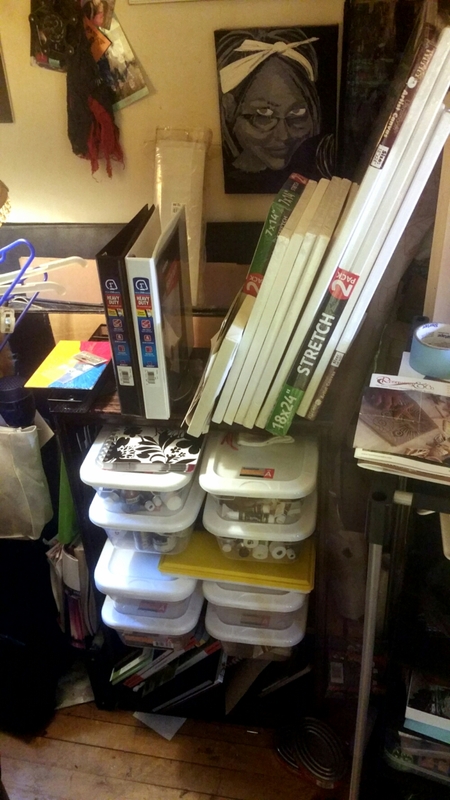 The eventual goal is to have all my supplies within the same space and accessible. Painting is my main thing but I also enjoy drawing and making beaded and acrylic resin jewelry. Right now my paraphernalia is spread to all corners of the house in various bins and piles. As you can imagine this hinders my ability to locate things when I need them. (I just recently found a few jars of painting mediums on my bathroom shelves?!) As we shift the living room around to accommodate my studio space I have become obsessed with aquiring cheap storage solutions that meet my needs. I have a shoe organizer that I use for some supplies and I recently purchased bins at the dollar store thinking I could put them in the shoe rack as drawers. Unfortunately they were too big for that application, but they fit perfectly in the bookshelf that I recently emptied by moving the mediums to the new rolling rack . The bins work great and give me enjoy space to place a pallet and my planner on top as well as store my metal leafing on the side.